Hey y’all! I hope you are staying warm and safe! Last week I shared 3 Tips on Staying Warm + Looking Cute. That outfit didn’t have a coat as part of the ensemble and unfortunately sometimes coats are a necessity. Today I’d like to show how the length of a coat can make a big difference in how flattering or frumpy your outfit looks. The principle is a very standard one: definition. My mustard coat stops at my hip line, allowing the skirt’s length to get it’s full effect of making me look taller due to eyeline travel. The black coat stops much farther down, cutting me off at an awkward spot. In our family, coats were always the thing you invested in once every 4 years or if you grew out of your old one. I was usually tired of my coat by the end of the first season (and it was always black. boring.). Then, I realized you can find coats on sale or at thrift stores (Or ThredUP) and have a lot more fun with them. I got this mustard one for about $20, instead of investing $70 (on sale) like my mom did for the black one. Does the black coat look terrible? No. But it certainly doesn’t add anything to my overall appearance and I don’t feel very put-together. I do like to keep two coat lengths, though. Right now I only have this mustard one because I haven’t found the perfect long coat, but I’m on the look-out. 😉 Another thing to look for is how the arms fit– the slimmer the arms the slimmer you look! Definition is a simple concept, but one that makes a big difference. 🙂 What’s your coat look like? Is it longer or shorter? Do you like how it looks with your outfits? Have a great day! really awesome outfit! 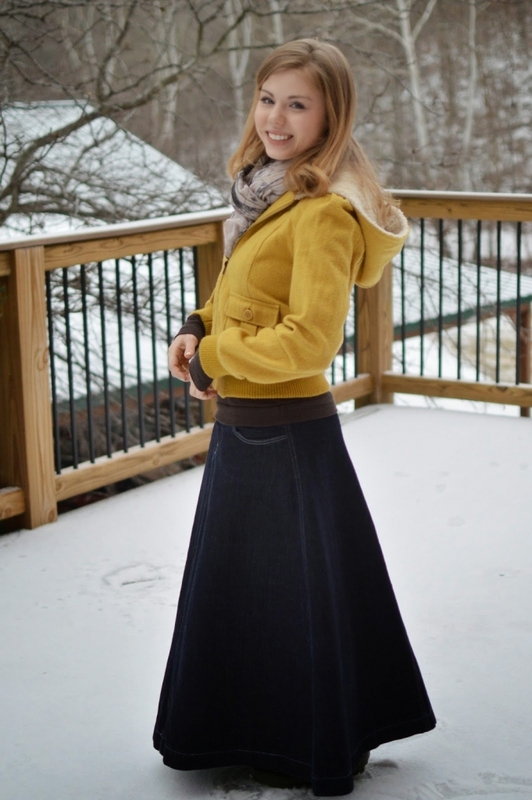 I always have trouble finding a coat that looks really good with skirts, or pants. Thanks for the tips! I have a bunch of coats, thanks to thrift stores! 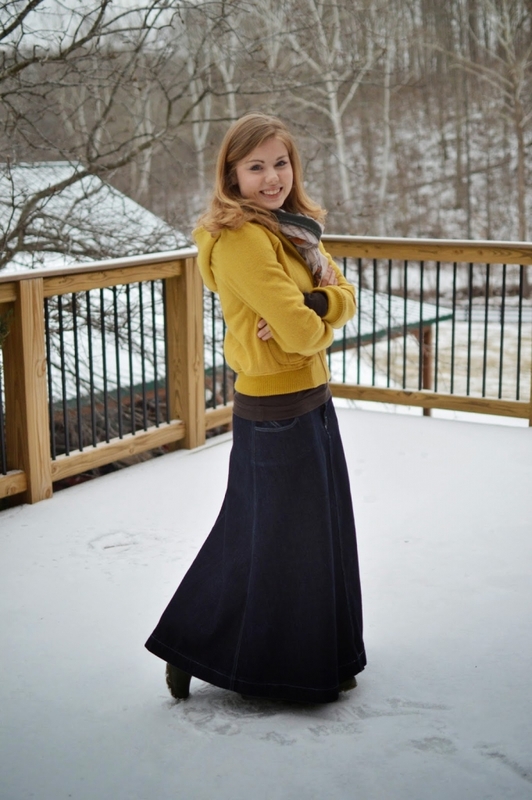 Same as you, I use a short coat (about the same length as your mustard one) for maxi skirts. 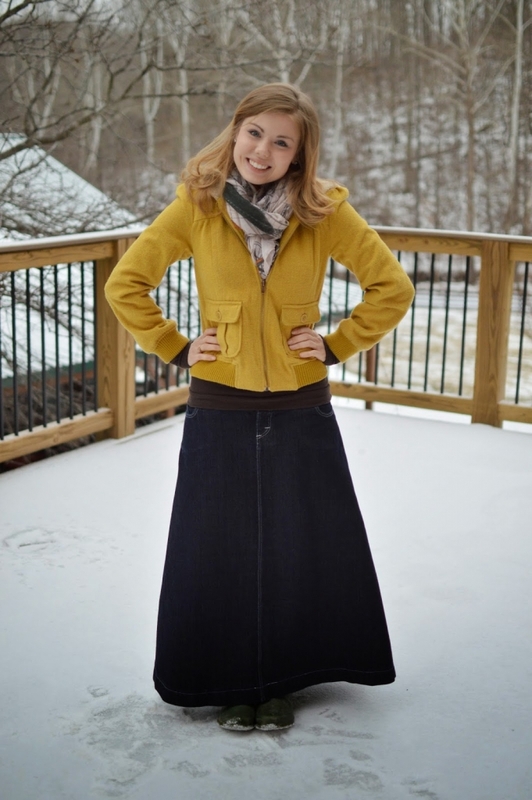 For my knee length skirts, I generally prefer my long coat (which has a belt at the waist). Although, with a knee length jean skirt, I often find myself wearing a shorter, more casual jacket. You look lovely in both, but I agree the shorter one suits you the best. My favorite coat to wear is a tailored mid-calf length coat. It goes well with both my height and dressy style. Wow! This was a great, practical post!! Loved it!! This was a really good post. Choosing the right coat certainly does keep the entire appearance of your outfit flattering or not during the cold, winter months. I have a few nice coats to match with different outfits, but my favorite is my Carhartt coat, because it ends right below my waist (I'm really tall and it doesn't exaggerate my height). Also, I like it because it is very warm, durable, and since it is dark brown, matches mostly everything. Love the mustard coat outfit! That map scarf is adorable! 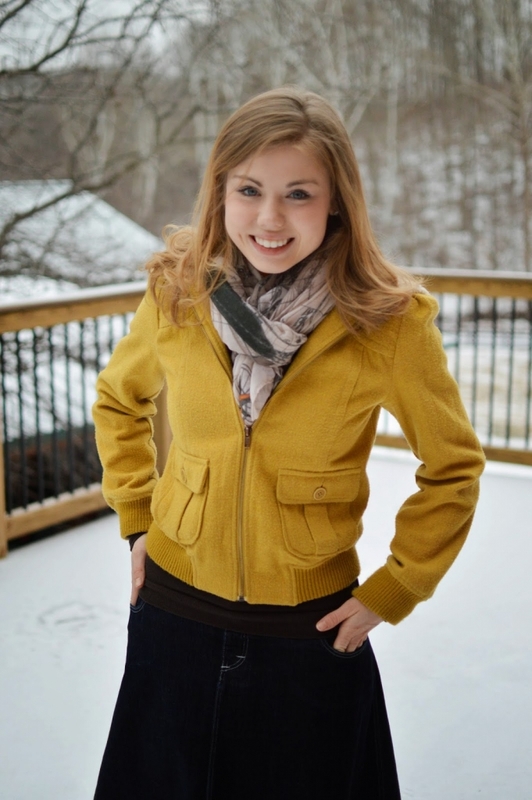 Great tips on investing in a coat that will work for you! One thing I might add for those who are really looking to make their coat more worthwhile is to consider what colors you will be wearing it with. If you are a person who wears navy AND black as neutral bases for outfits a lot, you might want to get a coat that is able to be worn well with either (perhaps a grey, or another color that won't clash with your wardrobe). Thanks for sharing! That mustard coat is really fun! My coat is probably closer to the length of the black coat you modeled. It is black with a wide (very wide) 50's inspired collar and it has a belt that synches around the waist. It has a vintage flair while still being professional and modern. One fun addition you can play around with when wearing "boring" colored coats is a really fun scarf. For quite a while I wore a deep red, fuzzy scarf sprinkled with sequins. Thanks again, Olivia, for sharing! I alternate between a longer dressy coat and a longer casual coat. Short coats means my legs and bum are cold, which is not a good thing on days like today, where the weather is -40C!! I like the look of a shorter coat, but warmth trumps fashion for me! I loovee the world map scarf and all the coat advice; I especially like the visual comparison between the two styles! NY is breaking cold-weather records, so jackets are super important here. One of mine I got off of ThredUP – it's wide, long, and has zero waist definition, which allows for a sweater, thermal, and other layers (thanks for your last post about staying warm!) underneath to combat -15 degrees, but feels SO frumpy. After reading this I'm thinking I want to look into getting a short coat, to bring back a better silhouette. I had no idea that your coat can make such a big difference!!! Thanks for showing me this!!! I have a long cream coloured coat…. but sadly I almost never get to wear it as it is hardly ever cold enough. I'm giving up on looking cute. Or staying warm for that matter. After they canceled church on Sunday I haven't been out of my pjs and slippers and blanketdress all weekend. (That's my coat. Full length. Emphasizes my need to stay toasty.) It amazes me how much not having church (and being snowbound) threw off my whole routine. All I've done is lounge around and play Civilizations. The only thing I'm proud of is keeping on track of my Lenten reading, finally getting my mending done, and finishing my set of silk pillowcases. Yay for cold hunker-down weekends! This is a very useful and informative post. Thanks Olivia! I'm one that hasn't really mastered the art of coat-wearing–perhaps since I was born for warm weather! I just wear what the weather calls for-shhhh! Don't tell, but when it's -30 I wear a bulky, ugly ill fitted Carrhart. Most of the time I wear my down Burgandy coat, hip length. I also own a couple pea coats. Cute! And great tips! I usually have two winter coats that I try to hang on to until they start to wear out. One wool pea coat for church and a waterproof one for the snow. I also love your facial expressions when you compared the two coats! That mustard colour is just gorgeous and really brightens up your look for winter! Would you ever wear red lipstick with it? (Maybe you don't wear red lipstick) anyway, loved it and the scarf too. For milking cows and feeding goats I wear a big, fleece lined Carhartt. (glad to see I'm not the only one:) It's warm but not cute. I have a red down filled winter coat from Burlington Coat Factory that I've been wearing for 10 years. I should probably replace it. I've never liked short waisted styles on my body type. because of my rectangular, very un-hourglass shape, I like something that gracefully skims my stomach and stops at the hip. Hey y'all there's a family near where I live and there house burnt down this weekend there was nothin they could salvage, they have five kids and have nothing except there diary farm. Please just keep the Baileys in you prayers. thanks!